I wanted to write a little bit on the last 2 years of my life and all the healing that has taken place. When I started my recovery journey 2 years ago, I couldn’t even let anything about my birth mother come out of my mouth without sobbing like a new born baby. I was angry and I was hurt when it came to her. I was expected to keep quiet my whole life so when I finally was sitting around a group of women in my Step Study for Celebrate Recovery, and everyone was going around sharing about their life and all of a sudden it was my turn it was very emotional for me. I remember everyone looking at me, and I shared with them that I wrote a letter to my birth mother as a healing exercise and in that letter I expressed all the hurt and pain I have experienced from her making the decision to give me up for adoption, to strangers, and to a woman that couldn’t raise me. I was angry with her, and the letter shares all of my anger. All of these years my anger was flaring in every way imaginable, and I was happy to finally be able to have the tools to get to the root issue, dig up the root and lay it down at the cross. This doesn’t mean I don’t hurt, because every day I struggle. It just means that God has given me the gift of forgiveness and because of this gift, I’m able to begin to heal and move forward with my life. Acceptance has been a key for me but the question is, what am I accepting? You can’t accept anything if the truth is being kept from you. My entire life, I was lied too, the truth was covered to protect me, but in the long run it has caused me more harm than good. This is not fair for adoptees and I will never stop speaking about something that has hurt me the most in life. I prayed for grace, and God has given me grace. I was someone who was mad at the world, and when you are told your entire life that the feelings you have about your first family, no matter what kind of people they were should be that of non-existence but you want so badly to know who they are and where you come from it definitely plays some tricks on you. How can I learn to share feelings in life, but never speak of those who are a part of me, my own flesh and blood, and my biological roots. I will never be FOR adoption because it has taken so much for me and caused me so much pain and at the same time I see the need in certain situations that adoption is necessary. I believe adoption needs massive reform and every adoptee on this earth deserves to know where they come from. I believe the lies, secrets, and all the hurt that comes from adoption are based on man’s decisions and people on this earth and an industry that is very corrupt has caused unthinkable pain for adoptees who have their identities locked in a filing cabinet, never to be discovered. Why should we have to fight for something that is already ours? When I was able to receive every bit of what was already mine to begin with, is when my healing began. I had to search alone, and fine all of my biological family alone. No one supported me, and no one helped me. No matter what the outcome, searching and finding everyone and seeing their faces on my own has been my ticket to healing and freedom. Instead of believe what everyone had been telling me all these years, (which was lies) I was able to be filled with peace in seeing things on my own, and being able to form my own conclusion about my biological family members. This has been critical to my healing. If you look at my writings 2 years ago, you will see the anger. You can read the letter to my birth mother and feel my anger. You can read her letter I wished she wrote back to me and see there was healing in writing that. Next, I will be writing a letter in response to what I wished she wrote me. I had to do the work and uncover the truth, so I could work on my deep seeded emotional issues with abandonment and rejection before I could write the next letter or move forward with my life. 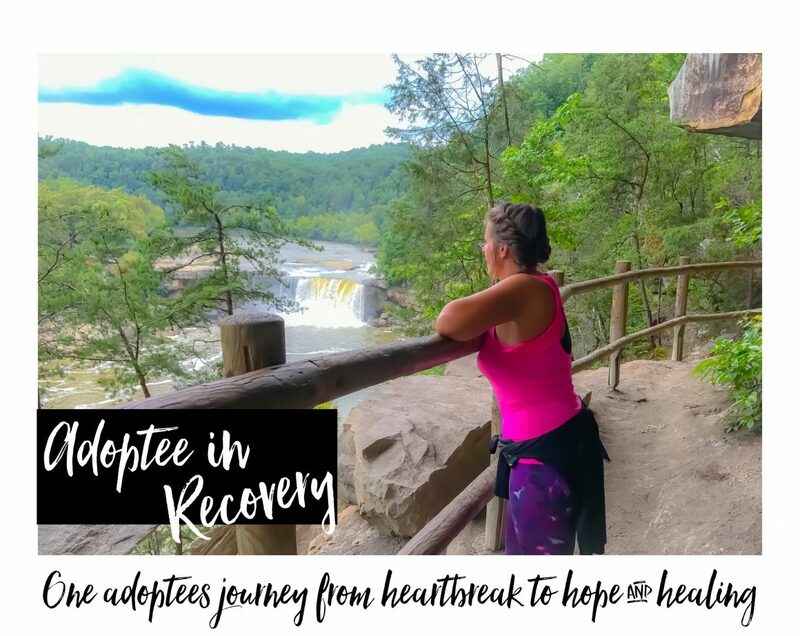 This healing journey is a process, and I had to accept the fact that this pain may never go away, but processing my feelings like I need to are helping me and I pray that in time things get easier, most important I need to believe with my heart that it will get easier. I will be 40 in about 6 weeks. I wish I could figure out how to be happy on my birthday. Don’t you know if I could I would? I’m learning that now I can cry, and talk about my feelings and that’s okay. Does anyone really want to hear it? I honestly don’t think so and that’s why I write. This is a healing place for me. I feel like if only I would have gotten that letter from my birth mother, like she promised I could take it out on my birth day and read it and maybe it would make me feel better. But instead, I have nothing. I wish everyone close to me would write me letters for my birthday, but I wonder if they will think I’m crazy for this one simple request? I feel like if I ask, it won’t be sincere or true so no need to bother. If I could open up a basket or a box full of letters I think I would ball like a baby. No one on earth but God understands the depths of my pain in this area. I’m so thankful I can share it with my blog readers. Every day in every way I am reminded of the loss of my first family. I’ve accepted the loss, and I have recently accepted the pain that may never go away. I’m so thankful that my healing started before my kids moved out of my house. I don’t think I could do this alone, or without them here to take my mind off of it on occasion. Mother duties call daily, and this gets my mind away from reality. I’ve come to the conclusion that Learning the TRUTH is the ONLY way to healing and freedom. Now, as I go get ready for church I feel great I got all this off my chest and I’m thankful for this place that is healing for me. You need to be heard, and I hear you. You are entitled to your feelings, and you are so right about the need for truth. I'm so sorry your birth mother didn't write that letter. I'm a birth mother too (my son is 46, and we've been in reunion for 2 1/2 yrs. ), and I would do anything to help him heal, so it's very difficult for me to understand how or why your mother is unresponsive. I have to assume that her pain is every bit as deep as yours, that perhaps she is afraid of what might happen if she opens that door she's kept locked by even a crack. My advice would be to not lose hope. Work through your own pain until you reach a point where forgiveness and compassion replace anger (justified anger is still self-destructive). Listen to your own heart, not the advice of others if it just doesn't feel right. People may try to understand, but unless they've stood in your shoes they can never completely understand or necessarily know how to help you. You need your mother to love you. Until you can receive that love and she can give it, you will have to love and mother yourself. Think about what you need, then figure out the best place to find it. If it's not going to come from your mother, find a support group (there are lots online). Don't be afraid to tell your truth. It's a long struggle, but secrets and lies won't make it any easier. And do understand that in offering advice to you I'm really giving myself a good talking to. I wish I could speak to your mother and urge her to reach out to you. You must feel as if you are being rejected all over again, once as a helpless baby and now this. It certainly isn't fair. I wish I could tell all birth mothers who want to remain hidden: You are hiding from nothing. The world will not stop spinning if you live your truth. You can do something to make amends for your past. It's never too late to love your child. I'm an adoptee who has been rejected by her first family. I have no contact with them 3 1/2 years into reunion. My mother will only communicate with me if I go see her, which I did. She won't come to my house, text, email or talk on the phone. She doesn't seem to care if she ever sees me or my 4 children again. This tortures me constantly. My father does not care either. His daughter's 26th birthday is July 1. His daughter will be the same age as my daughter (his granddaughter) until my daughter turns 27 in August. My mother's grandson will be 5 on the same day. My mother travels to her kept son's house to babysit for her grandson every week day so his parents can work, but she can never come see me. The travel time would be about the same. Some days I just don't know what to do with the pain, and some days it's not so bad. Adoptomuss, Thank you for reading my blog post! I can say I totally relate to your pain and I understand what you are going through because I have been through it. It's heartbreaking. Please know you are not alone. We have to make decisions that make us happy and what feels right to us. I tortured myself the way you have for many years. Relationships take 2 people. If the other person isn't willing to reciprocate then I couldn't continue to put myself out there to continually get beat over the head. Let's face it, for adoptees we don't feel “Touched” by adoption. We feel BEAT OVER THE HEAD BY IT. I got sick of feeling bad about it, and that I wasn't good enough for them. I kept those who loved me and reached out to me and wanted a relationship, and let those go who didn't. Please know that I can't speak for your birth mother, (like so many in adoption land try to do) but from my experience so many birth mothers are experiencing a tremendous amount of pain from the relinquishment and it's not necessary us they are rejecting, its the pain. This helped me with healing and I hope and pray it can help you too. Do you write about your pain? I have found this blog to be a very healing place for me! Also pam, I found my sisters father for her ( we were adopted as babies ) she met him and he died shortly after that of cancer.My father died 3 years before I found him ( we will meet again in heaven ).